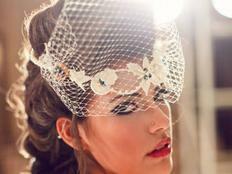 ​I can custom design a Vintage Brooch Bouquet or Headpiece with Vintage Brooches. 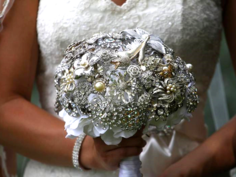 With a vintage brooch bouquet, there is no need to worry about preserving your bouquet after the wedding! Each one is a totally unique, one-of-a-kind piece of artwork that will last forever. I can create your bouquet from my collection or from all your brooches, earrings, cuff-links, (or a combination of the two!). I can also incorporate family brooches into my collection. Why not hand your bouquet down to your children to use in their weddings. Best of all it is customized to fit your color, style, theme, size and budget! 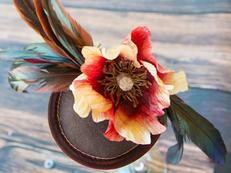 Custom or pre-designed Bouquets are priced based on size and specific brooches/jewelry used. All vintage brooches are personally hand picked by me and the design possibilities are endless. Looking for more than your bridal bouquet? Not a problem! Brooch the Possibilities can also design bouquets for your brides maids, cake tops, headbands, headpieces and boutonnieres.